Boggy Hole is located in the Finke Gorge National Park which around 120 km west of Alice Springs NT. Boggy Hole is one of the permanent waterholes on the Finke River which was used by the early explorers as a “highway”. This is amazing 4wding as the track zigzags along the actual river bed as it passes between the towering red cliffs of the gorge. It is slow going with long sections of crunching river rocks, patches of soft sand and in the dry even bulldust to negotiate. This track begins on Larapinta Drive near the Hermannsburg mission. The first 12 km is a well used track maintained to service a local aboriginal community. 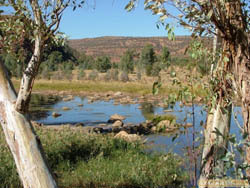 It then enters the river bed of Ellery Creek which it follows for 10 km before joining the Finke River where there is a camping spot.